Simple solution to restart the MS Explorer in Windows 8.1 and Windows 10! 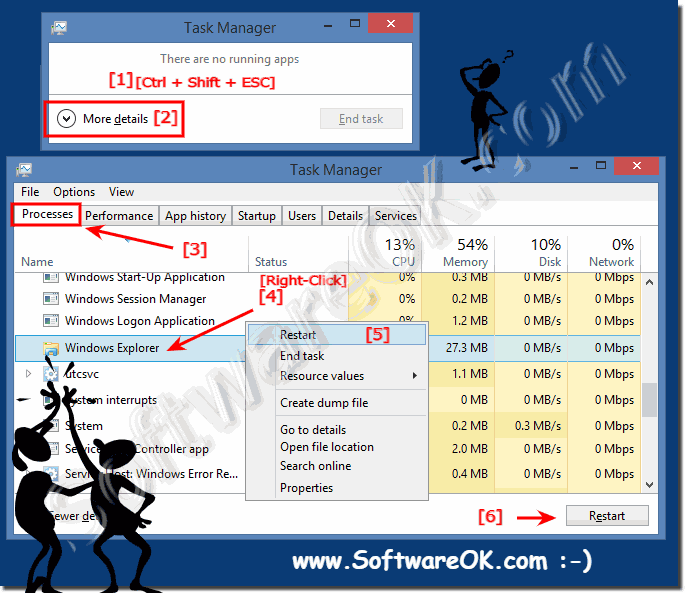 To restart the Microsoft File Explorer in Windows 8.1 press the key combination [Ctrl + Shift + ESC] to run the Win 8.1 Task Manager. In Task Manager, click on the text more details then you will see all programs and services in Windows 8.1! Now select in the list view processes the Windows Explorer and by right-clicking open the selection menu. Restarting of the MS-Explorer is very useful when it comes to the trailer in Windows 8.1 . Optionally, you can also use other file managers such as Q-Dir. (Image-1) Restart or kill the MS-Explorer in Windows 8.1! Windows-8 - FAQ-178: Restart the MS Explorer in Windows 8.1 / 10 (Reset, Filemanager)!